It was just a Bird. Well, actually a tropical Mexican falcon. I was watching him in his cage at a small Zoo as he sat on his perch and kept turning around, as if to show me his right wing. He was a beautiful creature of God’s making, with tenacity, strength and nobleness. Falcons are raptors, like Hawks and they can be ferocious to other creatures! 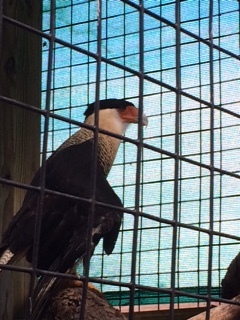 They are birds of prey with strong, sharp talons, keen eyesight and hooked beaks used for their hunting skills. As I watched him I realized the right wing looked different than the other one and it seemed to hang down a bit. It looked to have been damaged, maybe even broken at one time. If one ponders on all the travails a Falcon could encounter, it’s not difficult to imagine a wing being damaged or clipped. Texas is awash with different types of birds, particularly Hawks, as they winter in our fields and cities, soaring high over buildings or perching in our many pine trees to swoop up a field mouse, rabbit or snake! It never fails when I hear the birds in our neighborhood squawking loud warning sounds that it’s usually because a Falcon or Hawk is flying overhead or one has already managed to pick up a fledgling bird. The neighborhood cats become wary also! Birds can do funny things with their wings, besides during their mating rituals, they can use their wings as protection. 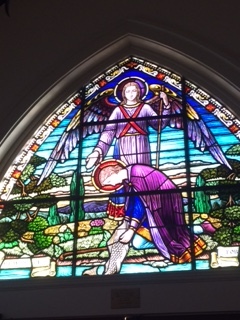 Just like I picture my Guardian Angel does for me when needed! Once, when out for a walk when living in the Texas Hill Country, we saw a large momma Quail in the brush. The chubby Quail had a nest for her baby quails and when she saw us she started “dragging” one wing dramatically on the ground and scurrying away from her nest. She served her purpose of distraction as we watched her instead of going to look at her nest. Such a smart design God! But the Zoo Falcon I was now watching was standing tall, hopping around on his perch and adapting quite well when another, larger bird pen-mate jumped closer to him and took over his perch. I watched their pecking order ritual and then suddenly saw my broken wing bird start to fall and wiggle on his stick. The other bird stayed strong, didn’t help at all by moving over. Definitely a bird with boundaries! My broken wing buddy, fluffed his feathers, looked tenuous and then suddenly picked up and stretched both wings, albeit one being crooked, and flew to the other side of the cage. He landed safely and balanced, turned his swivel head around and looked at me. Well, you can fly old bird, I thought. Such a symbol of experience, adaptation and strength this guy was. The injured Falcon in all it’s glory was made of good stock but mindful of it’s surroundings and limits and ready to learn as well as move from harm if challenged or threatened. So much like me, so much like us all, it seems. Life lessons abound around us, all the time. We don’t always pay attention or at least I don’t. Lessons that can comfort, heal, protect us and allow us to have peace and enjoy life. Like the importance of “staying focused” in life and not becoming distracted by extraneous social noise or other birds. Or lessons like, “staying mindful” and appreciative of God’s gifts by living in present moments, listening to what matters in one’s own environment and not another birds‘. Or lessons of “paying attention to one’s instincts“, or feelings, to gain wisdom and truths about ourselves to know when or how quickly to move to another perch! And one of the best lessons, “being proud of our own feathers, color, and wing span in life”. 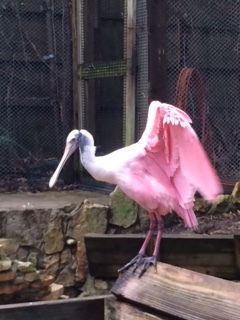 Who knows, some of us may turn out to be the prettiest of them all, like the pinky Flamingo-like, Spoonbill bird who represents love and fun in the human flock but looks so different growing up in the bird world! When my daughter Missy was little she bemoaned her very curly hair. She didn’t understand why she had to have curly hair when all her friends had straight surfer-girl hair. She conditioned her curly hair. She put straightener on her hair. She wet her hair and wore a tight knit hat on her head to school. She even ironed her hair. But it always stayed curly. 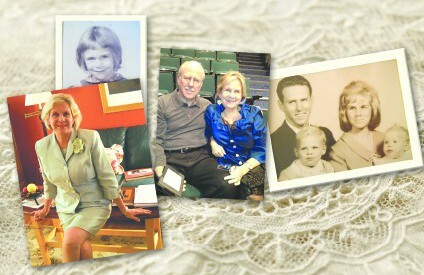 As she moved into different seasons of her life, the times caught up to her hair. Soon, everyone wanted curly hair and put potions on their straight hair. Missy beamed with her natural look. She became a proud and beautiful curly feathered bird! God gives us all different feathers and wings. Sometimes we use our wings to preen too proudly, to cover ourselves in old shame, to comfort ourselves, to protect others or sometimes we use our wings to distract a dangerous foe. Sometimes our wings get broken along with our hearts and we feel we will sadly limp along for the rest of our future. No…remember my feathered Falcon friend who was able to fly when needed. We may have to rest, be comforted, nurtured and then heal for a season or two but most of the time, ‘even broken wings can fly’. In life, we are protected by Wings, both spiritually and earthly. God covers us with protection and gives us Grace when we least deserve it. The Holy Spirit moves us and Jesus teaches us how to fly. And those people who love us on Earth cover us with sweet supportive Wings made of downy feathers of understanding, encouragement and loyalty. Some of our earthly friends will even distract foes for us by showing strong spread-out Wings of warning. And some of us are still learning life’s lessons and are growing our own Wings to help cover and protect others and it’s just like the phrase in the movie, “It’s A Wonderful Life”…”everytime a bell rings, an Angel get’s it’s Wings”. So, stretch out…Accept your own color of feathers, use your own Wing span to help others…Ask God to help you, then spread your Wings, feel the wind under you and soar like the Eagles.